Veeva Systems has an innovative platform to meet the growing demand for cost-cutting in the health care sector. Veeva Systems (NYSE:VEEV) has been turning heads recently, as it unrolls its data cloud for the life sciences industry. In a space dominated by big players like Salesforce.com (NYSE:CRM) and Oracle, Veeva has been carving out a niche for itself servicing some of health care's biggest players. Its platform of logistical cloud-based software for customer relationship management (CRM) is designed specifically to help drug makers operate more efficiently. Finding its place at the union of health care and tech, Veeva seems to have hit the scene at just the right time. Veeva has come on the scene during a huge tech and biotech IPO season. With the market at all time highs and investors looking for exciting new opportunities, conditions are ripe for young development stage companies to go public and raise funds. Those conditions allowed Veeva to effectively raise north of $260 million while still maintaining a spotless balance sheet. While Veeva is certainly young, it's one of an elite class of tech IPOs that hit the market with a profitable business. With big name customers like Eli Lilly (NYSE:LLY), Merck, and Novartis, it's clear that market penetration is not an early headwind. In its first quarterly report, Veeva listed $6.5 million in net income on $55 million of revenue in its first quarter as a publicly traded company. With Salesforce.com, Oracle, and even Amazon.com Web Services paving the way for cloud computing, Veeva is by no means a technological pioneer and in that sense is late to the cloud computing party. But it's not too late. The industry as a whole still has plenty of room to evolve, and Veeva's platform stands out as an innovative application of SaaS and CRM. In fact, Veeva's relationship with Salesforce.com is a key component of its business model. CEO Peter Gassner was former Senior VP of Technology at Salesforce.com and has built Veeva's software on the structure of Salesforce.com's platform. Salesforce.com stands to benefit from the relationship, too. A value-added reseller agreement grants Veeva exclusive industry rights to the Salesforce Platform and kicks Salesforce.com an undisclosed fee. The partnership highlights the versatility of Salesforce.com's platform and helps the company diversify into an untapped market. It also represents a source of high margin growth for Salesforce.com, as it distributes the fixed costs of its cloud infrastructure over new revenue streams. One of the major running story lines has been the impending doom of the patent cliff. That threat of diminishing revenue from generic competition has forced major cost-cutting to curb R&D and SG&A spending and streamline operations for many pharmaceutical companies. Eli Lilly, one of Veeva's subscribers, is a good example of a big pharma player with struggling revenue streams and bloated costs. Lilly is facing generic competition for blockbusters Zyprexa and Cymbalta, and has invested billions to replace those drugs with new therapies. They haven't seen a great return on that investment, though, after Alzheimer's drug solanezumab and cancer therapy ramicurimab failed to live up to expectations. 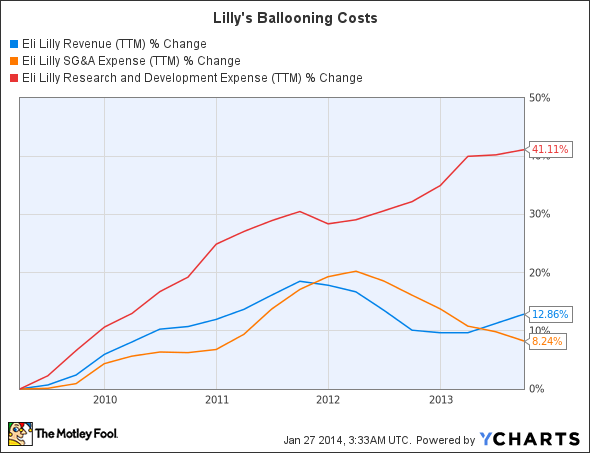 That's caused expenses to continue to balloon, and Lilly has resisted the wave of major restructuring that has overtaken its big pharma peers. Veeva is primed perfectly to lend a hand to a company like Eli Llly. Veeva CRM, the company's cornerstone product, connects sales reps with management through any Internet connection. That allows management to collect information and sales data from any customer, selectively distribute targeted marketing campaigns directly to representatives, and identify marketing inefficiencies to reduce cost. On the development front, Veeva has unrolled Veeva Vault, designed to seamlessly coordinate clinical trial execution. An overwhelming amount of paperwork goes into trial design, data collection, analysis, and regulatory filing. Vault provides a single cloud-based interface to facilitate all of those processes and trim out inefficiencies. Vault represents Veeva's real growth prospect, and the challenge will be to create a full ecosystem of cloud-based operations by converting CRM users into Vault users. Just because Veeva has come along at a wonderful time when health care demands IT solutions for its efficiency problems doesn't mean that now is the right time to jump in as an investor. The case presented here lays out some very bullish arguments for Veeva's growth, but when a company's stock is trading at nearly 200 times trailing earnings you better be sure to understand the potential pitfalls, as well. Check back soon, when I'll breakdown some of the headwinds Veeva will face moving forward.